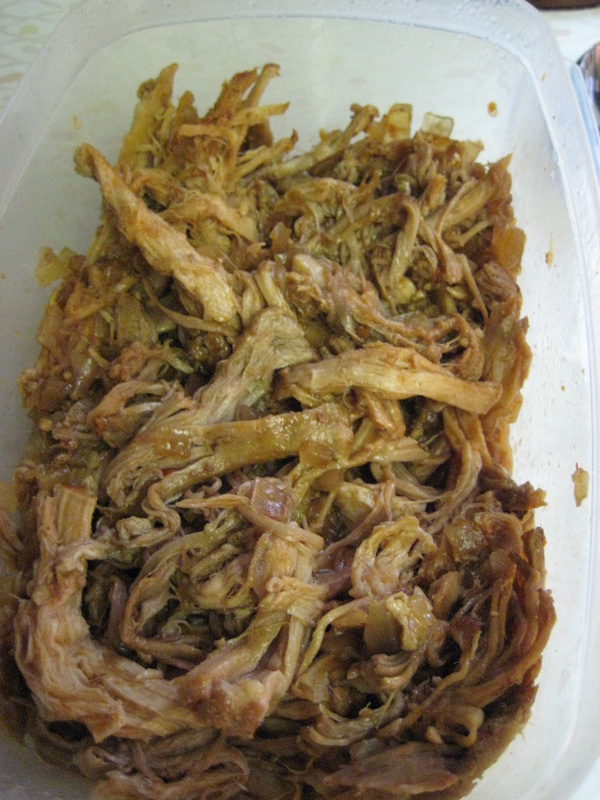 This crockpot pork recipe is delicious! It’s very similar to the Cafe Rio pork — but less sweet, and more of the pork flavor shines through. Absolutely delicious! I imagine you could make this with chicken, as well, with similar results. My pork didn’t turn out nearly as red as Joelen’s, but I think that’s because I was unable to find La Victoria taco sauce, and substitued another brand for it. We served it as tacos, and can be served any way mexican meat is — tacos, nachos, enchiladas, burritos, over salad, etc! Also: Since we hadn’t had it before, I elected to halve the recipe and make a 2 lb pork roast. Next time, I’ll make the full amount and freeze it for future meals! I also made this on a Sunday and just re-heated it during the week for our meals, since I wouldn’t be home during the week to add the other ingredients after 6 hours! – Place pork roast in a crock pot with the garlic and onion. Add water halfway covering roast. Cook on low for 6-8 hours. – Drain water and add remaining ingredients. Cook 4-6 more hours on low. – Shred pork and serve with tortillas, rice or whatever you’d like. I love these. And honestly? I can’t believe I didn’t think to do it. Making lasagna in a disposable bread pan — it’s just the right amount for two people for one meal! And even better — it makes 3 loaf pans, so you essentially can make 3 meals and freeze the other 2 for later. You can make any flavor/type of lasagna you want with this method. Check out Joelen’s original recipe through the link to see some of the other creative lasagna ideas she lists! – Preheat your oven to 350 degrees if you’re planning on eating one of these as soon as you make it. – If you choose to include italian sausage in your lasagna, crumble the bulk Italian sausage or sausage removed from casings into a hot non stick skillet. Cook the sausage completely, drain from any oil and set aside. – In a small bowl, combine the ricotta cheese, 1 1/2 cups of the shredded cheese, chopped parsley, and salt & pepper to taste; set aside. – Prepare your loaf pans by putting a few tablespoons of pasta sauce on the bottom. This helps prevent the pasta from sticking to the bottom of the pan and gives the no boil pasta sheets some moisture to cook. 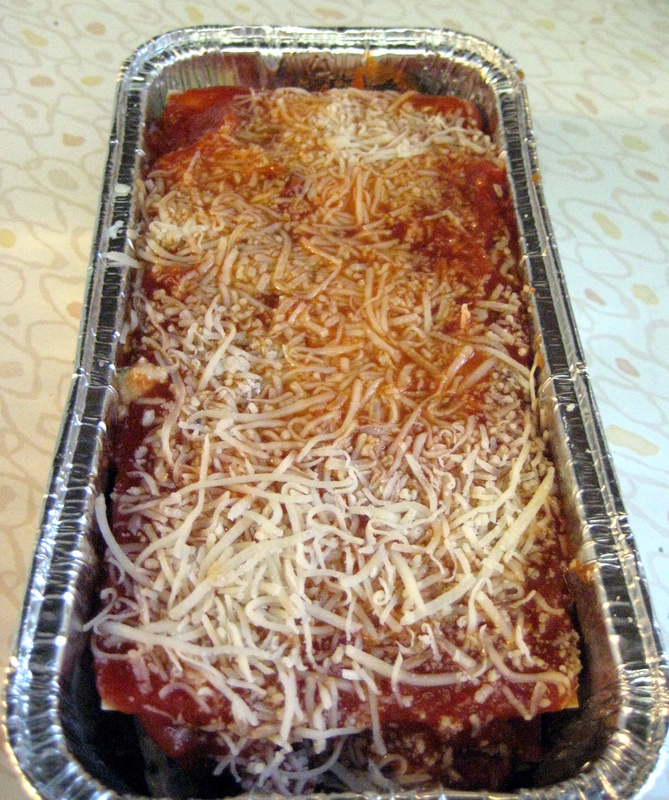 As you build your lasagna, be sure to have the pasta sheets surrounded by pasta sauce – on the top and bottom. This helps the dry pasta sheets cook with enough moisture since they are not being cooked beforehand. – Next, place one no boil pasta sheet in the loaf pan. It won’t sit in perfectly but that’s okay. Continue layering the lasagna because eventually it will settle flat on the bottom as it cooks. – Top the pasta with another few tablespoons of pasta sauce, followed by a few spoonfuls of the ricotta cheese mixture, a sprinkling of shredded cheese and more pasta sauce. Repeat until you’ve filled the loaf pan to the top, making sure to end with a pasta sheet. Top the pasta sheet with more pasta sauce.